It’s never a good idea to open your front door until you know who’s on the other side. This is where a good peephole comes in handy. It’s also wise to fit a quality door chain, especially at the front entrance. This is a commonsense precaution for anyone, but a decent door chain is especially recommended for older folks who live at home alone. People sometimes unknowingly invite confidence-tricksters into their homes, often posing as officials of some kind. These crooks may steal valuable objects as well as information about the occupants when they’re off guard. It’s important, therefore, to not let anyone into the home until you have confirmed their identity. Q. What Is a Door Chain? A chain or door restrictor is a simple device that allows you to control communication with people standing on the outside of the door. These tools are typically just a couple of inches long, attached to your door and doorframe around head height. The chain prevents the door from opening beyond a crack. There’s just enough space to communicate with the person on the other side and to receive small packages. Q. Why Bother with a Door Chain? Every year in the US there are around two million recorded house break-ins. There are many others that go unreported. Roughly thirty percent of all burglaries occur through open or unlocked doors and windows. It’s better to open a door with a door chain than without one. They’re not perfect solutions, but they don’t cost much and they offer some protection, and that’s never a bad thing. However, some door chains and door restrictors are so weak that a small child could kick their way past them. In these cases all you have to rely on is the visible deterrent, but that’s a bit of a gamble. Therefore, it’s wise to invest in a heavy duty product and have it installed properly. This provides the best defense and it also prevents someone from tampering with the chain or restrictor from the outside. Q. How Does a Door Security Chain Work? Door chains give you some protection when you need to open the door. More importantly, they give you a few vital seconds whereby you can slam the door shut should an intruder try to force their way in. For a small investment, a door chain adds an additional layer of home safety and security. It’s important, though, not to let them give you a false sense of security though. They can’t take the place of quality deadbolts and strong entrance locks. For door security chains to work to best effect you must fit them properly. The chain fixture has to attach to a stationary surface, usually the door frame, and the slide catch to the door. The slide catch must be close to the door’s edge. If it’s too far away you won’t have freedom to attach or detach the chain. If in doubt get someone to fit it for you. It’s a quick job, but it is important to get it right. There are alternatives to door chains, and those are the somewhat stronger swing bar door guards or door restrictors. Like the door chain, door restrictors also only allow the door to open a little way. The difference is that they are significantly stronger than the majority of chains. You will often see these fitted to doors in motels and hotels. They won’t scratch the door either, as there’s no chain swinging and tapping against the door each time you open it. One of the main flaws with door security chains and restrictors is that they come with short screws. This makes it easy for a powerful kick to tear them away from the surface. There’s a simple solution to this problem, and that is to use longer screws. On the door side, attach using screws 1/8″ to 1/4″ shorter than the door’s thickness. This will provide optimal strength. Tip: It’s always a good idea to pre-drill all your screw holes to ensure the best possible fit. Fit door chains or door restrictors to whichever doors are entry points into your home. The front door is usually the most important as it’s the one that the majority of strangers approach first. Depending on the structure and urban layout, callers may also use a side door or back door. Only you can know which doors on your property get used. Remember, these are inexpensive security tools that are easy to fit and provide a little extra safety and security, making them a good investment for the money. Q. When to Use a Door Chain or Restrictor? Get into the habit of latching your door chain or door restrictor at all times. At the very least, attach them when you go to answer the door to a stranger, at any time of day or night. Don’t let official uniforms or well-dressed people lead you into a false sense of security. Confidence tricksters pose as whoever they think will instill the most trust on the doorstep. This could be a city official, builder, charity worker, or anyone else they think the occupant might believe. If in doubt, always, always, always ask to see some form of identity, and then check it out before opening the door. If it’s someone who says they’re from the electricity board, for example, a simple phone call to the head office will do. If in doubt, send the caller away. Q. Who Benefits Most from Door Chains & Restrictors? 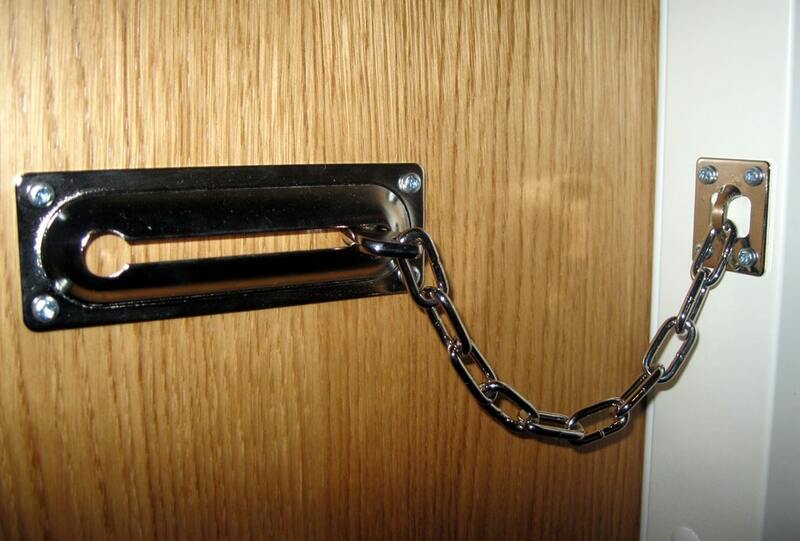 Door chains are for anyone, not only seniors, but senior safety is particularly important. The older we get, the less able we are to fend off or escape from an intruder if we need to. It’s an unpleasant thought, and fortunately most folks won’t have to go through such an ordeal. For others though, it’s a sad reality. The first layer of door security should be a clear peephole, or better still, a peephole viewer camera. This way, you get to see who’s at the door before you make a decision whether to open it or not. The safest door is one that’s locked and shut. And if you do open the door to a stranger, it’s better to have a security chain, or the stronger door restrictors, than nothing at all. A good quality door restrictor or door chain gives seniors and their families extra peace of mind. Older people, and particularly those 70 and above, are more vulnerable than younger folks in society. Many are too trusting for their own good when it comes to dubious callers. Some people who run financial scams, fraud and house break-ins target old people living at home alone because of their vulnerability. The best advice for seniors is to not open the door at any time of day or night until you can verify who the stranger is on the other side. The front door is usually the main entrance into a home, and so it should be the most secure part of your structure. Other doors and windows need to be secure too, but the front door is usually the main priority. Good locks, a strong frame, a peephole and a quality door security chain or restrictor all contribute toward better home safety and security.